Welcome to toys-toys-toys.co.uk, the official toyday blog where you will find craft projects to make, local news from our shops, toy reviews, interesting toy facts, games and other toy news. Birthday parties have become big business with every child having to have a better part y than their friends. You can hire anything; Party buses, bouncy castles and all sorts of children's entertainers. 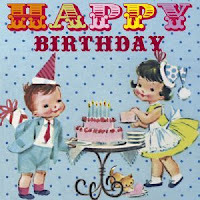 Easy for me to say with my love of all things traditional but do we really need to spend lots of money to give our children a good Birthday party? I think the way to go is homemade. 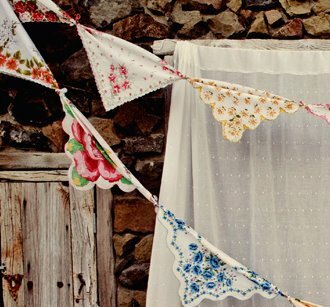 I've seen a great idea of making your own bunting out of old hankies. One way of doing this was to just fold them and knot them on to each other at the corners but if you wanted to make something more permanent that will last for future parties, you could sew them into triangles on to a long piece of ribbon. Do you remember paper chains? You can buy packs of gummy paper strips that you link into paper chains or if you have some old colourful paper handy, scissors and a glue stick you could have a go at doing your own. With the decorations sorted, on to the food. We keep chickens so to not use up some of the eggs in our own cake would be crazy but if your baking skills arnt up to it you could be amazed what creations you can come up with using a shop brought Swiss roll and some ready to roll icing or melted chocolate. When I was little I would judge a cake purely on how many sweets it had on it so bag a load of penny sweets for decorating it. 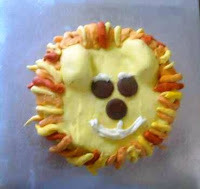 The lion cake pictured is something my sister came up with for my 3 year old nephews Birthday. He is a very lucky boy having a summer Birthday so he can have a party on the beach making it easy to keep them all entertained. Just give them one of our £2.50 bucket sets which they can take home instead of a party bag. If you've ever been to pizza hut you'll know that a visit isn't complete without a go on the ice cream factory. Well you could do one so much better for your party. Fill a table with all things ice cream related for the children to top their own ice creams. All those sweets left over from making the cake, wafers, nuts, sauces, cream, flakes, marshmallows, anything that makes an ice cream extra fun. You could get the children to fill there own party bags in a similar manner. Get some paper bags, you can always find some on eBay, then fill jars and bowls with sweets and treats and let the kids go crazy. As long as you've got more than enough sweets to fill the size bags you've brought then there should be no arguments. Get all the children to sit in a circle and go around the circle showing each one a card from a deck of cards. When a child gets a picture card they have to run to the middle of the circle put o n a hat scarf and gloves and cut off a chunk of chocolate from a bar with a knife and fork and eat it all before the next child in the circle gets a picture card and runs up to take their place. I've just finished wrapping layer upon layer on a pass the parcel for later. For older children you can always make this game more exciting with forfeits in between random layers. Going with a creative theme could be a good way to keep them entertained. You could buy a friendship bracelet kit and have everyone sat with there coloured threads sellotaped to a table making their own bracelets. You can buy extra threads from a craft shop if you have lots of children and you could get beads as well so they can make other things. This could then be there gift to take home instead of a party bag. If this is a bit girly we sell air drying clay that you could get creative with. There are so many themes and possibilities for a Birthday Party that I'm going to have to stop writing or I'll be here all night but I really love the idea of getting creative instead of letting it get expensive. History of the spinning top - How does the spinning top work? Get dressed up for this new years eve party! Who invented the Rubik's cube? © Toyday Toyshop Ltd T/A Toyday Traditional & Classic Toys. Picture Window theme. Theme images by selensergen. Powered by Blogger.